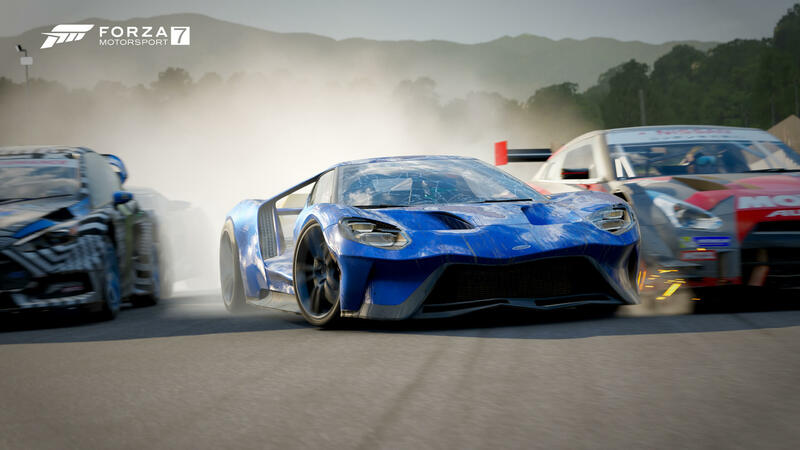 Turn 10 Studios is working on a series of enhancements and changes to the core fundamental aspects of Forza Motorsport 7, the developer revealed today on the latest installment of its Forza Monthly broadcast show. The news comes on the one-year anniversary of Forza Motorsport 7, which shipped exactly 12 months ago on Xbox One and Windows 10 PC. However, the team has also received this “great gift of time” that they never had with Motorsport titles before. Instead of developing Forza Motorsport 8 and shipping it next year as you’d typically expect with the annual release cadence of the Forza franchise, the motorsport team at Turn 10 Studios remain focused on updating and enhancing the current Forza Motorsport 7 experience we have today. That includes a brand-new roadmap for vehicle dynamics and physics, one which takes the team 2-3 years out from now, up to 2021. There’s a ton of stuff that the team are completely redoing or discussing about overhauling. Esaki, who joined Turn 10 late last year after the release of Forza Motorsport 7, has been the person considered the face of the game ever since the debut of these Forza Monthly broadcasts. He was given the opportunity to “shepherd the future of the product,” and that’s exactly what’s he’s done with each of the different post-launch updates for Forza Motorsport 7. From the all-new redrawn track limits to the rebuilt drifting experience as well as the experimental drag mode. As the name of the latter suggests, Turn 10 is doing a lot of experimentation in Forza Motorsport 7, and the developer divulged much of what it’s currently working on during the Forza Monthly broadcast in what it called a “super nerdy physics” discussion – and we’ll be seeing more of these in their upcoming livestreams as well. The first headlining aspect the team is working on comes in the form of an updated collisions model. Esaki and his team don’t like how the cars currently bump into each other in Forza Motorsport 7, nor how rigid the collisions feel. This also applies to the exaggerated collisions caused by high latency pings in online play. When combined the infamous issue of “turn one” in online play, it doesn’t foster the idea of bringing people into the game. The new collisions system that Turn 10 is experimenting with internally will resolve collisions between both players on their Xbox One consoles or PCs individually in online player. Once the impact happens, the game will blend where the cars are relative to each other, making the online collisions look, act and function like single-player collisions, resulting in a much smoother and more realistic crash all-around. Turn 10 didn’t like how the cars would hit each other like “volleyballs” upon impact, and this new system aims to solve that, giving the cars a squishiness factor. Now, we have the overall updated collisions system, but bear with us as there is some technical physics terminology needed to describe this. 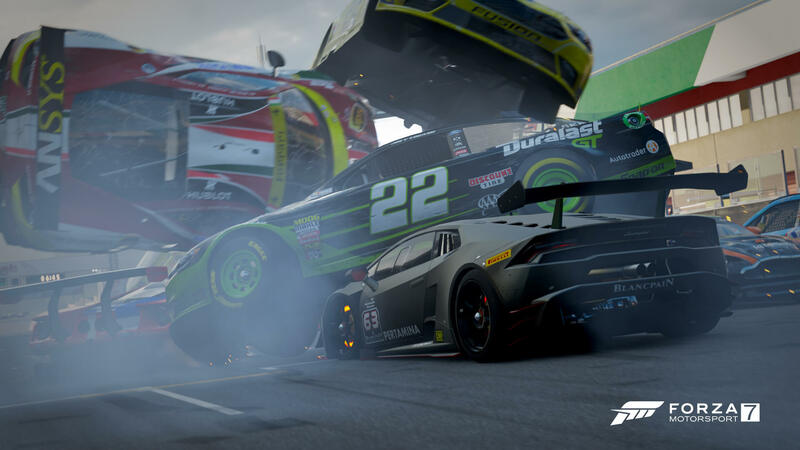 When two bodies hit each other, which in the case of Forza Motorsport 7 is a car and another car, or a car and something within the track environment, the impact takes time, and energy dissipates overtime. That is known as the crumple zone, with the squishiness of the two cars hitting into each other in the case of a player collision now delivered in a more realistic and a timely manner with recalculated tire physics and the newly-developed experimental collisions model that surrounds it. This means there’s a more accurate representation of a realistic physics collision, and the bumping that you’ll typically see in ForzaRC livestreams or online racing events feels way more natural now as the cars won’t be sent off the track as much with the new system deployed. Turn 10 is also developing a new collision assist option for Forza Motorsport 7 that will reduce the amount of torque that your car receives from an impact. This affects both cars involved in the incident, even if one of the drivers doesn’t have it enabled. It’s a per-player assist, but its implementation in-game means nobody will be able to pit people and ruin their race should it be enabled. For those who don’t want a super simulated car impact, this is the option for you. It’ll make it easier for you to retain control of your car when you’re bumped into, whilst also making the multiplayer component of Forza Motorsport 7 more accessible than ever before – tackling the potential chaos that can occur at the first turn of every online race. This lever, or aspect if you will, of Forza Motorsport 7 is an area of the game and overall franchise that Turn 10 hasn’t look at before, but now Esaki and the team are trying to use it to build a more enjoyable and accessible online experience. Whether its no collisions, light collisions or simulated collisions delivered in a realistic manner, this is the future of how collisions should work in Forza Motorsport 7 once the updated physics model is released to players sometime in the future. 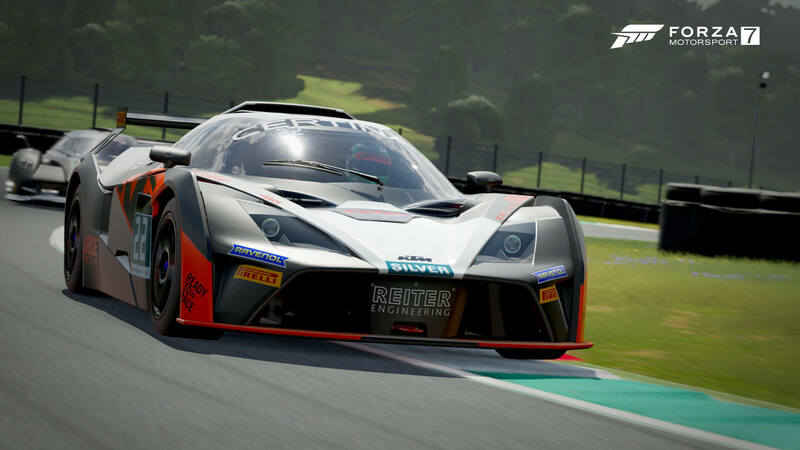 Keep in mind, we’re only at the experimental stage of this feature at this moment in time but coupled with the new ghosting and race adjudication systems being developed for the game, it should deliver a more competitive, enjoyable and accessible racing experience all-around. Esaki also revealed on the livestream that Turn 10 is looking into a potential player-rated system for Forza Motorsport 7 online play, but naturally didn’t confirm if it’s something we’ll definitely see in the future. 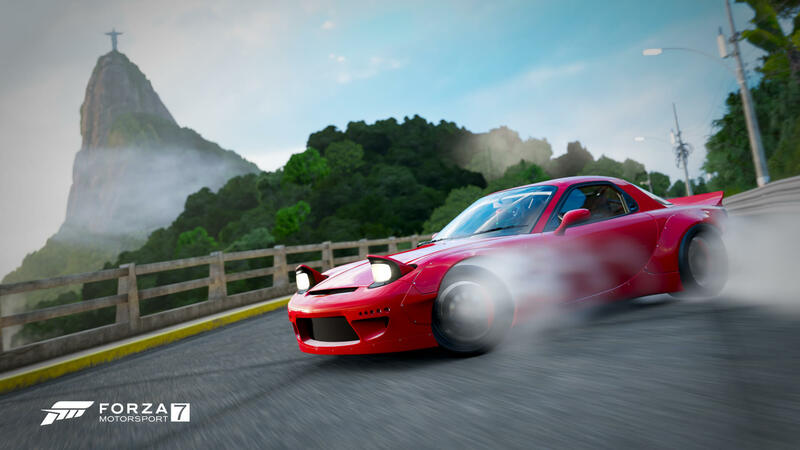 He did say, however that the new experimental features in Forza Motorsport 7, such as Meetups and the revamped Drift and Drag experiences saw the player engagement go from single-digit percentages to double or triple the player count. For example, almost 60% of players checked out the new experimental drag racing mode during its first week of availability. Before these revamped modes lit up in Forza Motorsport 7, only a small percentage of the game population would play them. But once the team turned on new features and added depth to them, there was a huge increase in engagement and enjoyment all around, and this allows Turn 10 to not only better understand their community and players, but also keep them engaged moving forward. For example, the Meetups feature occupied the top three most played Hoppers for their week of release, followed by the beloved fan-favourite, ABCs. Esaki believes the increased engagement is simply due to not only listening to the community, but also how players feel invited to try out these new features. Additionally, rather than relying on previous data the team would use, the developer is now using these new experiences instead and monitoring how players interact with them – with one overall goal, to make the multiplayer experience in Forza Motorsport 7 far more social than before. These areas are incredibly important to Esaki, as someone who loves talking and engaging with the community, and this drives how him, and the entire team think about the future of Forza Motorsport and where they’re going with it. So, whilst there’s no release date yet for the updated collisions and physics model – keep in mind this is just what’s being working on and experimented with internally, the team are also rebuilding their force-feedback system for wheel users as well. Esaki wants to begin treating their PC players and wheel users as “first-class citizens,” just like they do with controller and console. 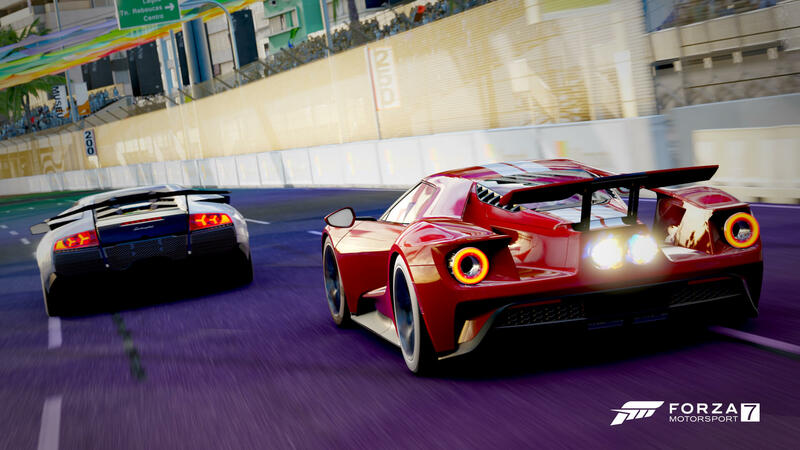 Forza has delivered seven solid generations of incredible gamepad support in each Motorsport entry, but Esaki admits the team haven’t done that yet with wheel. With the wheel and force-feedback support, Turn 10 is completely rethinking how it approaches this, but let’s take a quick history lesson first of all. Forza Motorsport 6 had the same force-feedback used for a couple of entries into the franchise, but you couldn’t feel oversteer with it – there simply wasn’t any feedback for this. Turn 10 used tires and their data to develop its old force-feedback system and produce an aligning torque. It would feed this data back to its database, which for the record is an unrivalled set of tires data, and then figure out how much torque should go back to the steering wheel. The element missing here though was the car and how to drive the vehicle’s reaction back to the force-feedback model. This was improved upon and fixed in Forza Motorsport 7, with the tire friction surface and its moving axis made relevant. This resulted in good oversteer and understeer, and it allowed drifters to let go of the wheel and lightly toss it, but there was still another element missing – the road. Data from the tire simply doesn’t have a way to feed road data back into the tire and ultimately to the force-feedback system. This meant Turn 10 had to take a completely different approach, go back to the drawing board and rethink the entire system from scratch. By essentially throwing away the old system that’s currently used in the retail version of Forza Motorsport 7, the developer drew up a new physical-based system. Because all cars have an accurate suspension system, they were able to use this to develop the new force-feedback model with torque and allow it to effectively reach the wheel. This delivers an accurate feeling, and based on Turn 10’s comments, once it’s setup, it works beautifully and is far more intuitive than what’s been in the Forza series before. 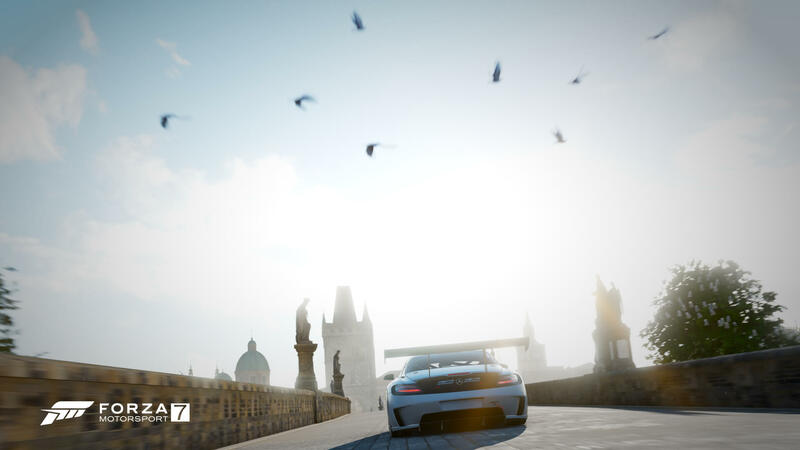 The most obvious difference to all-players with the new force-feedback system will be seen in how you drive straight across the different surfaces in Forza Motorsport 7, with the cobblestones of Prague being called out as a notable example. Additionally, the kerbs of track will also be felt as a driving force into the wheel. 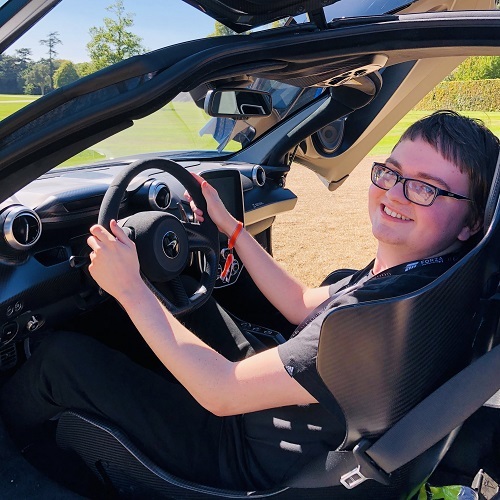 Naturally, the team continues to make tweaks to the system, but because there’s far more communication between the road and wheel than before, it makes the car more intuitive to drive – and much closer to driving a real car. However, this isn’t even everything that Turn 10 mentioned on its Forza Monthly broadcast that’s in the works for Forza Motorsport 7. There’s a new drafting system that’s on the internal “to-do” list if you will, as well as a newly-redesigned livery space. This one will actually be shipping in the near future, but it might not necessarily be this year. The goal here is to deliver a better lighting experience for painters by illuminating the design space in a better, more natural environment with selectable light schemes. 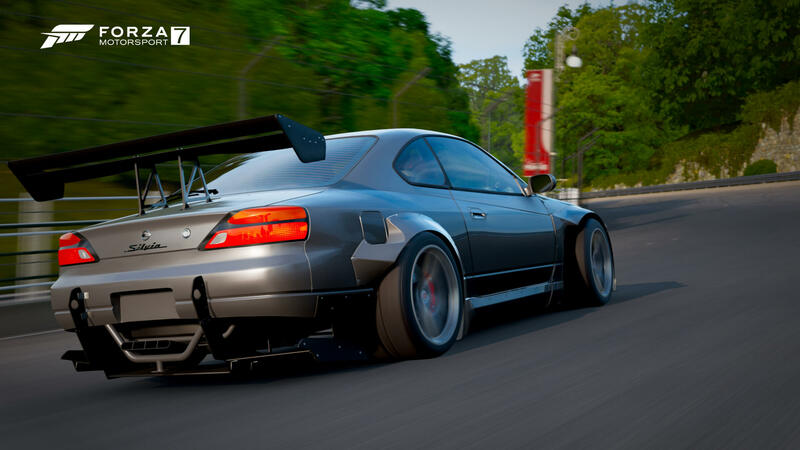 Esaki also noted that the entire lighting system used in Forza Motorsport 7 is another area of the game that Turn 10 wants to improve upon as well. This is the future of Forza Motorsport 7. An experience that’ll continue be updated, enhanced and redeveloped throughout 2018 and into 2019 to deliver on those core fundamentals of motorsport that fans have highly-requested. 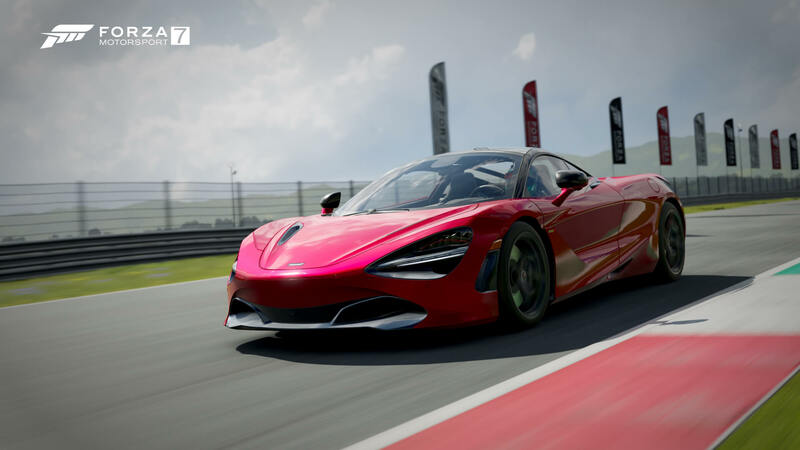 Whether it’s the revamped collision systems, the rebuilt force-feedback model, the redesigned livery space, or one of the many other upcoming additions being worked on for Forza Motorsport 7, these are features and improvements that ultimately benefit all players, and in the long run, the Forza franchise itself, as well as the in-house developed ForzaTech engine. 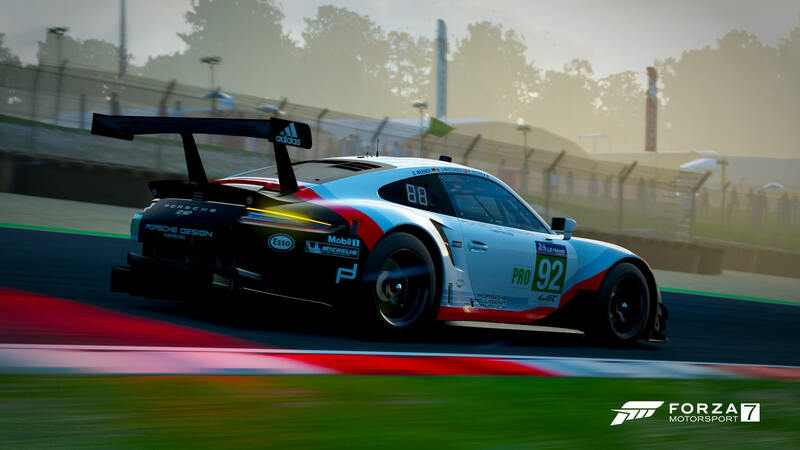 As for the short term, the eagerly-awaited Forza Race Regulations system will introduce online adjudication into the game “within the next month or two.” Esaki said the feature is almost final, and when complimented with the newly-redrawn track limits, it’s undeniably an addition that will change and improve the overall online racing experience in Forza Motorsport 7. In November, the developer will also take away its controversial Prize Crates system that has been present in the game since its release. 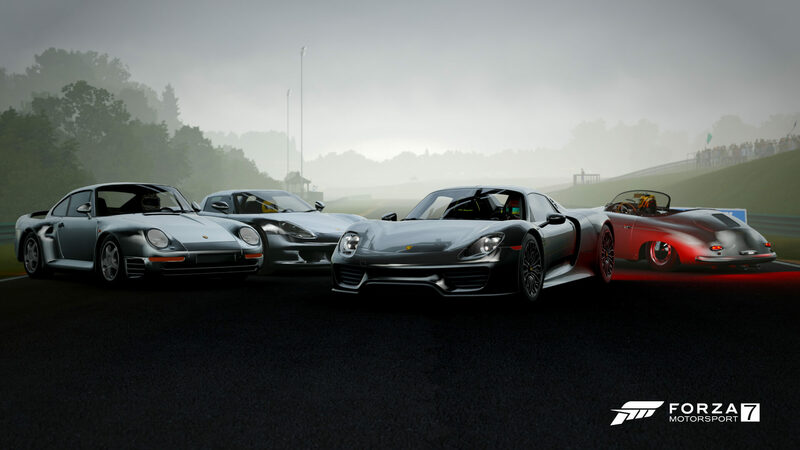 Whilst microtransactions were never included in Forza Motorsport 7, and will never be coming to the game, Esaki believes they just shouldn’t be present in a Motorsport title full stop. Replacing the Prize Crates system will be a new in-game ‘Race Shop,’ which is where you’ll be able to acquire new Driver Gear outfits, Mod Cards, and Player Badges using in-game credits. Esaki mentioned that the Race Shop will have a rotating stock of items that will refresh “every 6 minutes or so.” Everything that was previously available in Prize Crates can be bought in the Race Shop, and it also ties into how career mode races in the Forza Driver’s Cup typically only last a few minutes. It’s quite an elegant solution to the Prize Crates situation, as it’ll allow players to add Mods, go and race, before coming back and seeing what new Mod Cards and items are available. October will be your last chance to acquire Prize Crates in Forza Motorsport 7, because once the November Update has rolled out, you’ll receive any items you have from unopened crates, but you’ll no longer be able to buy them.